The Council’s Planning, Zoning and Economic Development Committee received an economic development update from the Revenue Authority of Prince George's County - Peter Shapiro, Executive Director; Donny James, Chief Real Estate Officer; Mark Graves, Chief Financial Officer, Revenue Authority/Industrial Development Authority of Prince George's County; Calvin Brown, Chairman of the Board, Redevelopment Authority of Prince George's County; and Eric Brown, Acting Executive Director. Important economic development projects were discussed. 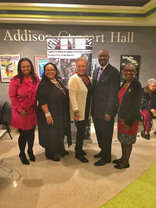 The Council hosted its annual Black History Month Celebration, “We Continue the Fight” on Tuesday afternoon, exploring the historical struggles of African-Americans, especially in the areas of education, employment, housing and politics, and ways communities are mobilizing to continue the fight for racial equality from both a national and local perspective. The Honorable Dorothy F. Bailey, former Council Chair, and Executive Council Member of the Association for the Study of African Life and History, and Karen W. Gooden, Esq. and Alvin Thornton, Ph.D., award-winning co-authors of Like a Phoenix I’ll Rise: An Illustrated History of African Americans in Prince George’s County, Maryland, 1696-1996, were guest speakers. Council Members Karen R. Toles (District 7) and Obie Patterson (District 8) also partnered with the Maryland-National Capital Park and Planning Commission and Coalition for African-Americans in the Performing Arts (CAAPA), for a musical tribute to the "Black and Brave" service members of the United States military on Tuesday evening at Harmony Hall in Fort Washington. Taking its queue from the Black History Month 2018 national theme, “War Heroes”, this classical music-driven took the audience on a melodious trip down memory lane on a timeline starting with our Civil War heroes leading up to modern day service members. 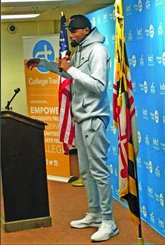 Tuesday evening, Chair Glaros and Council Member Karen R. Toles (District 7 – Suitland), attended an event announcing the Kevin Durant Charity Foundation’s 10-year, $10 million commitment to bring College Track’s renowned college completion program to Durant’s hometown of Prince George’s County, and creating the Durant Center, a new state-of-the-art educational and leadership facility in Seat Pleasant. Chair Glaros and Council Member Toles were among those who toured the Suitland site for the new College Track facility. The $10 million partnership with Prince George’s County Public Schools will help PGCPS students stay in school and get into college. The College Track @ The Durant Center will welcome its inaugural class from Suitland High School this fall. On Wednesday, the Comprehensive Housing Strategy Advisory Group met. 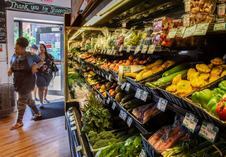 This February 25th Washington Post article, “Can a nonprofit grocer succeed in a Prince George’s city that Safeway left?” was inspired by the Council’s Planning, Zoning and Economic Development committee briefing on February 7th. 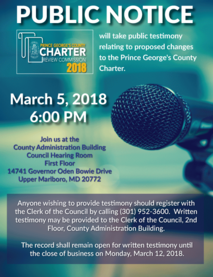 The Charter Review Commission will take public testimony relating to proposed changes to the Prince George's County Charter on Monday, March 5, 2018 at 6:00 PM. Anyone wishing to provide testimony should register with the Clerk of the Council by calling (301) 952-3600. Written testimony may be provided to the Clerk of the Council, 2nd Floor, County Administration Building. The record shall remain open for written testimony until the close of business on Monday, March 12, 2018.